What is call center quality monitoring? Quality monitoring for call centers consists of using staff, software, or services to oversee customer interactions in a contact center. This is an important part of ensuring that customer service expectations are being met. It’s also a valuable way to gather data from customer interactions that can be used to make business decisions. Call center quality assurance monitoring usually consists of calls (or emails, or chats) between customer service representatives and customers being reviewed. This can happen in real time, or in review of recordings. The reviews are then used to provide feedback and training opportunities to the representatives. In some cases, extensive data is also gathered to by analyzed and distributed to the organization. The short answer- any company that utilizes a call center should invest in quality monitoring. 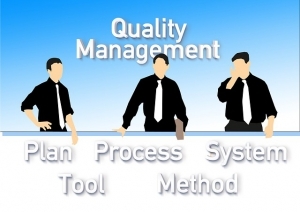 Utilized appropriately, quality monitoring pays for itself in the business benefits of improving customer service. It provides opportunities to improve the quality of customer interactions, improve customer loyalty and retention, and provide business insights that can help drive strategic direction. Without quality monitoring, a company lacks visibility to one of their most critical business processes- interactions with their customers. Companies without contact center quality monitoring are “flying blind”, and will be head to head with competitors who are utilizing the sophisticated insights garnered from call center quality monitoring systems. How is quality monitoring achieved? There are many different ways in which a call center can be monitored. Some companies utilize supervisory staff who are employees of the organization to monitor calls. This may work for some small businesses, but it requires a lot of expensive manpower. Other companies outsource call center monitoring entirely to a third party organization. This requires less effort and is more cost effective, but there are some tradeoffs. The company may have little say in how the third party manages the operation, and the scope of the quality assurance monitoring is less likely to be customizable. A third option is a software solution to manage call center quality monitoring. A software as a service package, like the one available from Evaluate Quality, founded by Sage Advantage, is an excellent fit for many businesses’ call center monitoring needs. How do I find the best quality monitoring solution for my business? It’s important to choose a quality call monitoring solution that is appropriate for your business. This includes both cost and customization. With Evaluate Quality, you will get a call center monitoring service that is totally customized to the specific needs of your business- saving both time and money. Evaluate Quality, in Scottsdale AZ, has helped companies large and small, in diverse industries, manage and improve their call center operations. For more information on the benefits that Evaluate Quality can bring to your business, contact them today to schedule a demonstration.